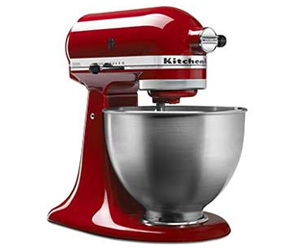 You can enter once for your shot at winning this KitchenAid 4 and a half quart Classic Red Stand Mixer, worth more than $200! The approximate retail value of all prizes is $230. The prizes are: 1 KitchenAid 4.5 Qt. Classic Red Stand Mixer. This Sweepstakes ends on 07/22/16 and you can ENTER ONCE to win.